The Ministry of Manpower’s (MOM) Job Vacancies 2018 report released yesterday (19 March) highlighted that employers are increasingly looking beyond academic qualifications, when hiring PMETs. 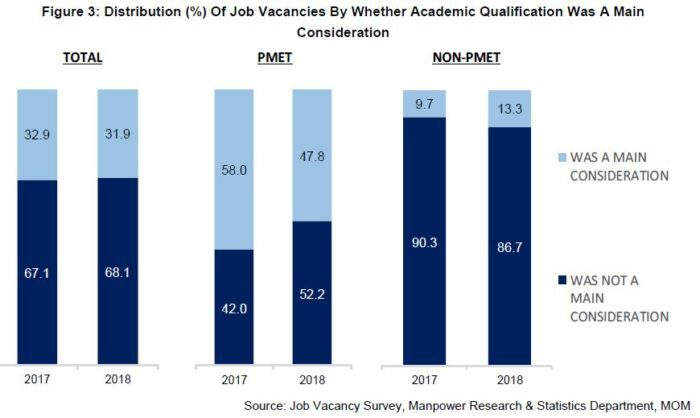 In fact, the proportion of PMET vacancies not focusing mainly on academic qualifications rose from 42% in 2017 to 52% last year. 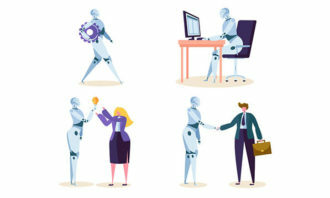 Instead, employers hiring for these positions placed more importance on relevant skills, work experience, soft skills and the right attitude than on qualifications. For instance, in hiring systems analysts and commercial and marketing sales executives. 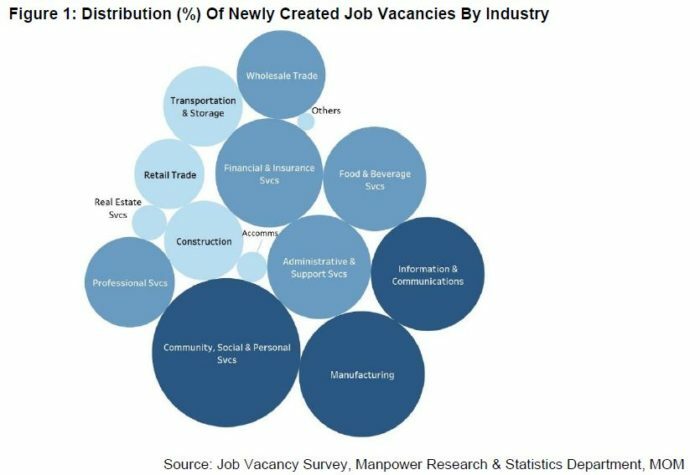 Apart from the above, Singapore’s employment landscape saw a total of 63,300 job vacancies last year, with newly-created positions comprising 42%. These positions were commonly in the social and personal services, manufacturing, information and communications, and community sectors. There was also an increase in the professionals, managers, executives and technicians (PMET) share of job vacancies, reaching 53% in 2018. This was a result of the increase in openings from PMET-dominated industries including professional services, information and communications, and financial and insurance services. At the same time, the share for clerical, sales and service workers declined (23%), while that for production and transport operators, cleaners and labourers remained unchanged (24%). 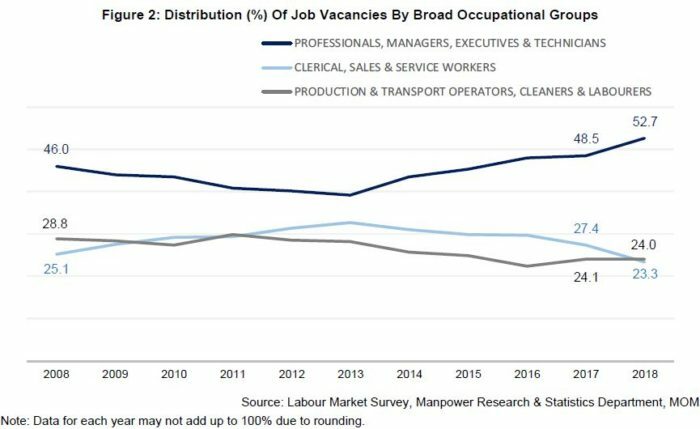 On a more mellow front, one in three job vacancies were unfilled for six months or more in 2018 (34%), a 1% increase from 2017. In these openings, a trend was seen whereby non-PMET roles were tougher to fill than that for PMETs. Based on employer feedback, this was because of a mismatch in the pay and working conditions offered, with what job seekers were looking for. For instance, 47.2% found the pay offered to be unattractive. According to the report, employers could consider redesigning these jobs to make them more attractive to locals. 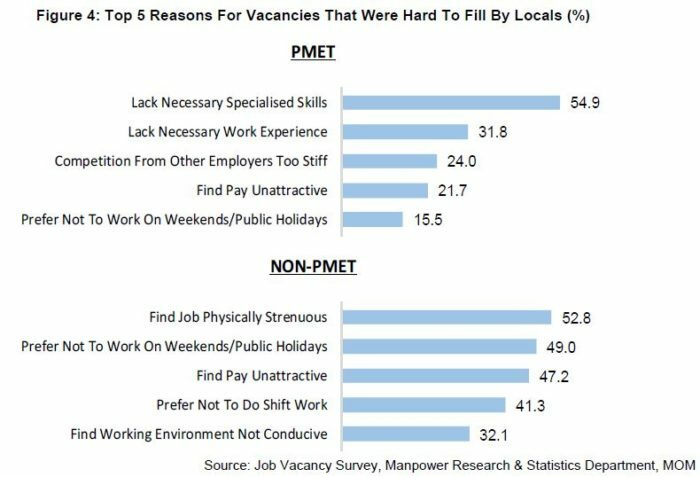 On the PMET front, employers commonly cited the lack of necessary specialised skills (54.9%) or work experience (31.8%) that made it harder to fill certain PMET vacancies. 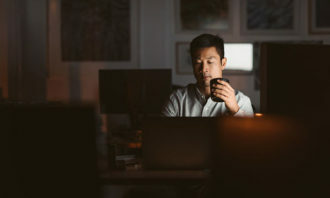 Job vacancies related to technology development and implementation continue to increase, as more companies integrate technology in the workplace. 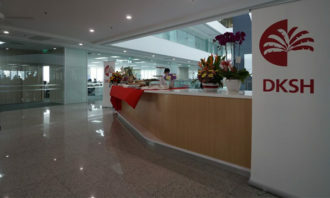 For instance, there was a demand for information and communications roles such as chief information officers, database designers and administrators, and more. 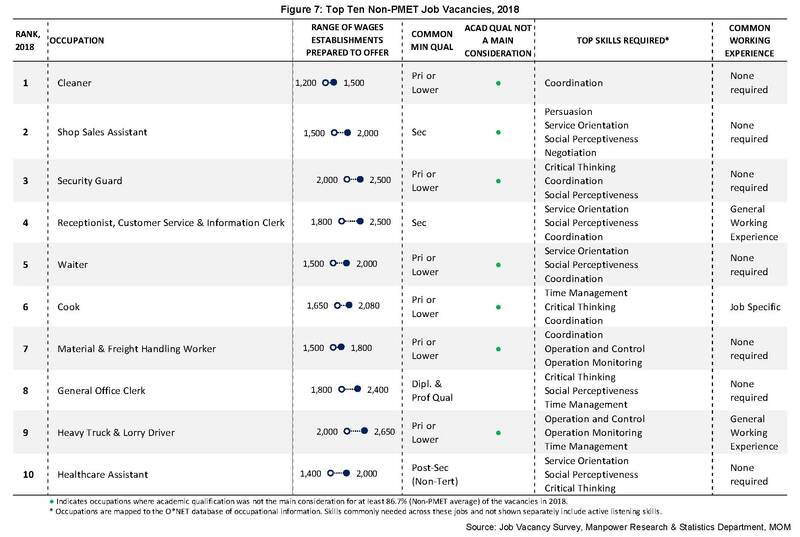 At the same time, finance, marketing and business development positions are among the top PMET roles in demand, including commercial and marketing sales executives in fourth place and business development managers in sixth place. Note: Open image in new tab to view full resolution. The survey covered private sector establishments each with at least 25 employees and the public sector comprising government ministries, organs of state and statutory boards. A total of 15,900 establishments employing 2,110,400 employees responded to the survey, yielding a response rate of 86.0%. It was conducted using mail questionnaires. Respondents could submit their returns online, by post, email or fax, with clarifications made over the phone.